BBC NEWS | Business | BMW's hydrogen car: Beauty or beast? BMW's hydrogen car: Beauty or beast? As one of the first journalists to drive the world's first series-produced car powered by zero-emission hydrogen, BBC News business reporter Jorn Madslien assesses whether it is a truly green initiative or merely a cynical marketing ploy. Racing to save the world? Heading north out of Berlin, towards miles and miles of German autobahn, the roaring six-litre engine belies the top-of-the-range BMW's true potential: to save the world. Powered by liquid hydrogen that is stored in a vacuum-sealed tank, the engine delivers a whopping 300bhp, yet the emission escaping through the exhaust pipe is mainly pure water vapour. 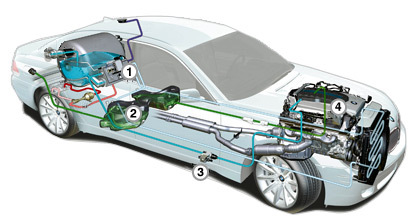 Unlike rival hydrogen models in the making, which use fuel cells, the BMW Hydrogen 7 is kitted out with a conventional combustion engine that can also run on petrol. This makes it possible to use it as an everyday car, which is why BMW has announced plans to put hydrogen powered cars into production, months or years ahead of its competitors. Having stolen a march on its rivals, BMW is far from shy about milking it for all it is worth. "We don't have a problem about saying it is a marketing exercise," admits Timm Kehler, responsible for marketing BMW's early developments and innovation projects. The hope is that the Hydrogen 7 will showcase BMW as a technologically advanced company prepared to take commercial risks to achieve long-term goals. As such it should help build brand loyalty. "It shows the company can respond quickly to increases in the price of fossil fuel," Mr Kehler says, adding that as the world will eventually run out of oil and gas "we'll need to start this now if we want to exist in the future". BMW has already received plenty of offers from politicians and executives, scientists and athletes, rock stars and TV personalities, all eager to help "create visibility for hydrogen". Madonna, David Suzuki, Al Gore and Arnold Schwarzenegger are said to be among a long line of celebrities queuing up to endorse the car, and perhaps further enhance their own green images in the process. But they will have to pay for the privilege. "All innovation invokes expensive solutions that can best be pumped into the market from the top end," explains Mr Kehler. "Here we have customers who are affluent and who are committed to technology. "They are in a position to pay for technology that may prove to be the status symbols of the future." From March next year, BMW plans to lease the car to trend-setters across the world. High-profile celebrities will probably pay less than lesser names, BMW acknowledges, though none of them will be able to dodge the substantial bills. And the customer will not only be fleeced. They will also have to endure a string of inconveniences - ranging from the explosion risk if the car is parked inside a garage, to the lack of luggage space caused by the massive hydrogen tank taking up half the boot. And because the tank's range is limited to 200km, driving the car will require careful planning. It is no good waiting for the fuel-warning to appear on the car's screen before starting the search for a filling station with this car. With no more than five hydrogen fuelling stations in the world supporting BMW's technology, early adopters will have to rely on mobile fuelling vehicles that are set to arrive, complete with support crews. Or they can press a little button on the steering wheel that switches to petrol and extends the car's range by a further 500 gas-guzzling km. Yet, despite such apparent shortfalls, the project is about much more than merely marketing, Mr Kehler insists. "I think the car itself shows you it is not just a facade," he says. "What we see here is a far reaching, advanced and mature technology." BMW says it wants to lead the way to encourage governments and investors to provide a regulatory framework and an infrastructure that can make a hydrogen economy a reality. "We want people who invest in filling stations to know there are users out there," says Mr Kehler. In Germany alone, it would cost 23bn euros ($29.4bn; £15.6bn) to introduce 2,000 hydrogen filling stations, thus making it an attractive option for consumers, according to BMW's traffic and environment manager Hans-Christian Wagner. In the long-run, investment would have to rise to about 200bn euros to replace the existing network of 16,000 filling stations. But although this might sound like a lot, the sums are relatively small when compared with other infrastructure projects, Mr Wagner insists. Even more important than getting the fuelling stations up and running is the need to find ways to create enough cheap and clean hydrogen. "Hydrogen is an energy carrier," points out Wolfgang Leder of Total Deutschland's new energy team. "There are several ways to produce it. Wind power would be the best, or solar." The problem is that currently most hydrogen is generated from fossil fuels, since the cost of generating it from, say, solar energy can be up to four times higher. And when hydrogen is produced this way, well-to-tank and tank-to-wheel analysis shows the overall carbon dioxide emissions from hydrogen powered cars can be higher than that from petrol or diesel powered vehicles. What is required is large scale investment in technology, BMW insists, and the carmaker - along with many of its rivals - is prepared to do its bit. "One day, even petrol and diesel will have to compete with hydrogen," predicts BMW's marketing and brand manager, Torsten Muller-Otvos. The company declines to divulge exactly how much money it has sunk into the project, though it says 300 of its 7,500 engineers work on it full time. This should raise the cars' cruising range, even if the tanks were smaller, since the combustion engine could be optimised for just one type of fuel, explains BMW's research and technology manager Thomas Dietsch. BMW also expects its competitors to succeed in their efforts to bring hydrogen fuel cell cars to the market, which in turn should boost demand for, and thus supply for, hydrogen at the pump. But first the industry will have to put up millions of euros of very risky investment that may never be recouped. Observes Mr Muller-Otvos: "If we only did projects like this, we wouldn't be too profitable in the long run."